Thai police released this sketch of the bombing suspect, Aug. 19, 2015. Thai authorities have issued an arrest warrant for a foreign man wanted in the bombing that killed at least 22 people Monday at a Bangkok shrine. Thai National Police Chief Somyot Poompanmoung said Wednesday the suspected bomber was likely acting as part of a network, but investigators have not yet established his motives or nationality. "He didn't do it alone, for sure. 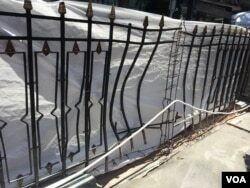 It's a network," Somyot said Wednesday, two days after the blast at the Erawan shrine that rattled the capital city. Authorities released a sketch of the suspect, a young man with black shaggy hair, stubble, and round, plastic-framed glasses. 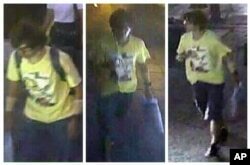 This Aug. 17, 2015, image, released by Royal Thai Police spokesman Lt. Gen. Prawut Thavornsiri shows a man wearing a yellow T-shirt near the Erawan Shrine before an explosion occurred in Bangkok. Authorities are offering a $28,000 reward for information leading to the suspect's capture. Grainy security camera footage appeared to show a slender, young man with unkempt dark hair and a yellow shirt leave a backpack under a bench and calmly walk away from the scene shortly before the blast. A police spokesman later said two other men, one seen wearing red and another wearing white in the CCTV video, are also suspects in the attacks. Buddhist monks hold a prayer at the Erawan Shrine at Rajprasong intersection in Bangkok, Thailand, Aug. 19, 2015. Local resident Kawait Nunthakunatip, who was passing by on Monday just 20 minutes before the fatal explosion, said she is happy to see it re-opened so quickly. 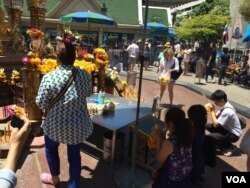 Those killed in the explosion include at least six Thais, five Malaysians, three Chinese, one Singaporean, one Philippine national and two Hong Kong residents, a reflection of the shrine’s popularity among Asian tourists. “It feels so weird to know that so many people have died here and so many have been injured and still laying, trying to fight for their lives," Danish tourist Maja Brash said. The shrine is located on one of the capital’s busiest intersections, across the street from Bangkok’s police headquarters. The city’s two elevated train lines both pass above the shrine, while a steady stream of tourists and worshippers make offerings and take photos throughout the day. No one has claimed responsibility for the attack and authorities have not pinned the blame on any particular group. But Prime Minister Prayuth has said it may have been politically motivated, aimed at damaging the tourism industry and, as a result, the economy. Other officials have suggested various theories, including elements behind Thailand's divisive political factions, Uighurs upset at Thailand's decision to deport more than 100 Uighur Muslims to China last month, or Muslim militants from the country's southern insurgency. John Blaxland, a senior fellow at the Strategic and Defense Studies Center at the Australian National University, said there is little clarity over who may have been responsible. Workers build a dam from sandbags as they attempt to seal off a canal to search for remnants of an explosive device that was thrown into the canal on Tuesday in Bangkok,Thailand, Aug. 19, 2015. Thailand's southern Muslim insurgency has killed more than 5,000 people during the past decade, but militants have rarely struck outside the border regions. The military government said the type of bomb used in the attack has not indicated that southern militants were involved. Since's Monday's blast, another bomb exploded Tuesday near a transit station in Bangkok’s riverside, but caused no injuries. A suspicious package found on a street shut down one of Bangkok's main downtown thoroughfares on Wednesday, but police later determined it was not a threat. Baker said if there are no further attacks, the impact of Monday's bombing over the longer term will recede. But further bloodshed would have major consequences. “If this turns out to be rather isolated and particularly if they manage to capture someone, I think the impact will be rather less than many fear at the moment. But if we get something else in the next few days it will be terrible," he said. In recent months Thailand has relied more heavily on its important tourism industry, as exports slumped and the currency weakened. Following the attack, the Thai baht has slumped to a six-year low against the U.S. dollar. Tour operators are confirming immediate cancellations by those too frightened to travel to the kingdom. Ron Corben and William Gallo contributed to this report.